I've read a string of manga series lately that focus on the embarrassing, silly, humorous side of love. Unfortunately, most of the attempts at being funny come off as stupid to me. Perhaps it's a problem with translation or perhaps I don't appreciate the series' sense of humor. Either way, Sand Chronicles is a welcome change from the stupid funny manga I've read recently. The first volume of Sand Chronicles starts when Ann is 12 years old and moves with her mother from Tokyo to the small town where her mother grew up. Ann is lonely and angry about moving. Her mother is miserable - seriously depressed. Ann's strict, over-bearing grandmother only makes things worse. Not too long after they arrive, Ann's mother kills herself. Ann is of course devastated at her mother's death. But slowly she finds a group of steadfast friends and a place in this rural community. Her best friend is Daigo. She's also friends with Fuji and Shika, two kids from a wealthy family. The volume advances two years to the point when Ann is 14 years old. Her friendship with Daigo is on the verge of something more. Both Ann and Daigo are just discovering it. But of course, there are those "mean girls" who want to thwart Ann's chance for happiness. My only complaint about this volume was that I often had difficulty telling the characters apart, particularly the boys Daigo and Fuji. At this point, I'm not too upset about that, because it often takes me a few volumes to grow comfortable with the characters in a manga series. I loved the emotion in this book. It felt real. Even the attempts at humor or the various troubles Ann got herself into brought out emotional reactions from me as opposed to rolling my eyes at one farce after another. The first volume is a heartfelt, serious beginning to what I think will be a wonderful tale of friendship and love. Thanks for the great manga review! I haven't had a chance to read this series yet but really want too! Have heard some great reviews for this one! This sounds pretty intereting, I like emotion in books. This series was so good. I remember crying while reading it because it's very sad (imo). I have heard of this series before, although I wasn't quite sure what to make of it. I'm glad to hear that the emotion presented was palpable. I'll have to check this one out! I've heard so many great things about this series. I actually waited for the series to be complete so I could read the volumes back to back. This will be my next manga series that I'll order for the library. So glad that you enjoyed it! 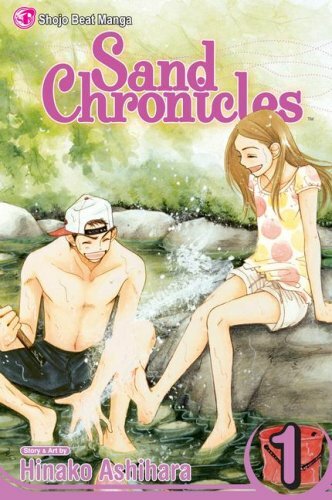 I used to read the Sand Chronicles in Shojo Beat, before the mag was discontinued. It wasn't my favorite series, but it definitely has a great storyline. I love this series so much. That real emotion is present the whole time. It can be so refreshing after reading silly manga. Don't worry about Fuji and Daigo. When they get a little older they don't really look alike. Not to me anyway. Can't wait to hear what you think of the next volume when you get to it. I think the humourous silly romance manga's you don't like might be the ones I love xD. Filled with antics, and spazzy females who get themselves into outrageous scenarios and cliched scenes. What Mistakes Are Acceptable In A Book? Are You A Book Cheater?